Toriola, Oshonaike lead Team Nigeria to 2017 ITTF World – Royal Times of Nigeria. 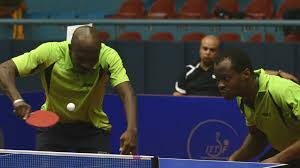 Africa’s highest ranked player, Aruna Quadri and seven-time Olympian, Segun Toriola will lead Nigeria’s seven-man team to this year’s International Table Tennis Federation (ITTF) World Championships holding in Dusseldorf, Germany from the twenty-ninth of May to the fifth of June. The Nigeria Table Tennis Federation (NTTF), said yesterday that African champion, Olufunke Oshonaike will spearhead the women’s team to the biggest table tennis tournament in the world this year. In the men’s team, Italy-based Olajide Omotayo will be making his debut at the World Championship as the former junior national champion has been included in the team following his exploits at the last ITTF African Championships in Agadir, Morocco. Omotayo who grew through the rank from cadet to senior is excited about his inclusion in the team, describing it as a rare opportunity. He however pledged to make his inclusion count in Germany.